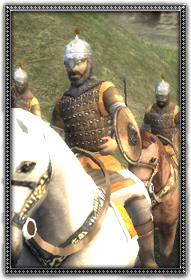 Recruited from the many Arabs settled across North Africa and the Middle East, these men make useful light cavalry, able to chase off horse archers, run down light infantry, and to get round enemy flanks. Their armour can be also be upgraded, allowing them to take on heavier cavalry. Although used to a hot climate, they are not desert troops.